Pebbledash – you either love it or hate it. If you’re looking to cover over your pebbledashed facade, we have two solutions for how you can cover over your pebbledash render without having to completely strip it back. A beneficial way of covering over pebbledash is by installing external wall insulation boards over the top of your pebbledash. Before applying any insulation to the pebbledashed substrate, it needs to be examined and checked, and pull-out tests will need to be carried out. In order to do this you can use a Hydrajaw fixing tester or you can perform a pull-test using the EPS insulation. This is just to check that the pebbledash will not come away from the wall and will be able to support the insulation. We recommend using the EWI-310 Universal Primer for a pebbledashed substrate. This will ensure a good adhesion between the EPS Adhesive and the pebbledash. The Starter Track is attached to the substrate above the DPC. This provides a level surface for the insulation to sit on, and it also protects the bottom of the insulation against weather and damp. We recommend using the EWI-225 Premium Basecoat as the adhesive for attaching the EPS. Apply the adhesive to the back of the board using the ‘dot and dab’ method – 3 dots in the middle and an even swipe around the entire perimeter. Attach the insulation boards to the wall in a staggered formation, interlinking the insulation from both sides at the corners. Ensure that the joints between boards are not in line with window and door openings. Because pebbledash is a particularly uneven surface, it’s important to continuously use a spirit level to check that the boards are flat. Where there are gaps between boards that are larger than 2mm, these should be filled with a foam adhesive. The important difference between insulating a pebbledashed wall is that you need to make sure the fixings go through the pebbledash and into the substrate behind. Fixings should be installed 2-3 days after the EPS boards have been installed. We recommend using one fixing per corner of each EPS board and two further fixings in the middle of the board. The surface of the EPS boards need to be rasped in order to remove the oily top layer. The upside of this is that rasping also helps to achieve a smooth surface and remove any imperfections. Rasping should take place 1-2 days after they have been installed to ensure the EPS Adhesive has had sufficient time to go off. To create the reinforcement layer, apply the EWI-220 EPS Basecoat to the surface of the insulation boards using a notched trowel. The reinforcement layer should be 5-6mm with a Fibreglass Mesh embedded within it. Once the reinforcement layer has dried, it needs to be primed prior to rendering. The primer to be used should correspond with the chosen render, for example the EWI-333 Silicone Silicate Primer should be used with the EWI-040 Silicone Silicate Render. The final stage is applying the thin coat render finish. Using a trowel, apply a thin layer of the render to the substrate. Ensure that the render is applied at a thickness that matches the grain size, for example 1.5mm grain sized renders should be applied at 1.5mm thick. The render should then be smoothed out with a trowel, and then rubbed up with a PVC float in circular movements. 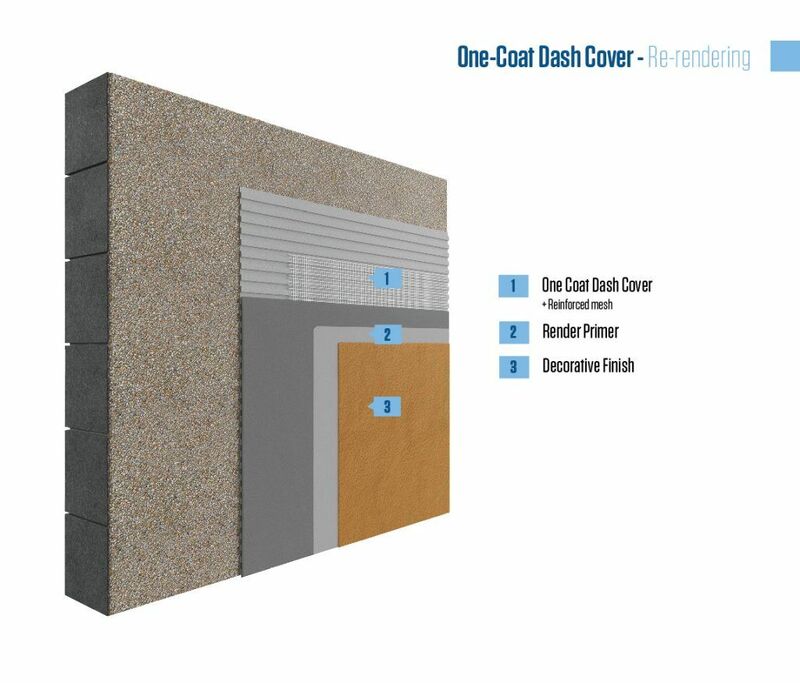 Rendering over pebbledash is easy when you use the EWI-065 One Coat Dash Cover (OCDC)! Ensure that the pebbledashed wall is stable and secure by knocking the existing substrate with a shovel or hammer. Loose pebbles should be removed, and any areas of crumbling pebbledash should be stripped back completely. Apply a layer of EWI-310 Universal Primer to the substrate. This will increase the adhesion between the pebbledash and the OCDC, and ensure that the substrate is stable. OCDC should be mixed with 5 litres of water per 25kg of dry mixture. In order to level out the wall, apply the first pass of OCDC (up to 20mm) to the areas where the Pebbledash has been stripped back. Once the first pass has set the second pass should be applied to the entire substrate, taking the total thickness up to a maximum of 50mm. Fibreglass Mesh should be embedded within the second pass of OCDC to enhance its tensile strength. A plastic, metal or felted float should then be used to create a smooth surface. Once the OCDC is completely set, you are ready to apply your decorative finish. At this stage, you can choose to either render or paint the substrate. For painting the substrate, we recommend using the EWI-005 Silicone Paint. This will create a breathable, waterproof surface that is resistant to environmental pollutants. When rendering the substrate, we suggest using a silicone-based render, such as our EWI-075 Silicone Render. This is highly breathable and hydrophobic, with self-cleaning capabilities to ensure a clean surface for years to come.